small craft advisory was in effect one day in late April. Winds were forming white caps on the Neuse River near Oriental. Fisherman Keith Bruno didn’t venture out that morning because of the conditions. But his guest did. Keith Bruno helps Lewis Colam push off from Endurance Seafood. 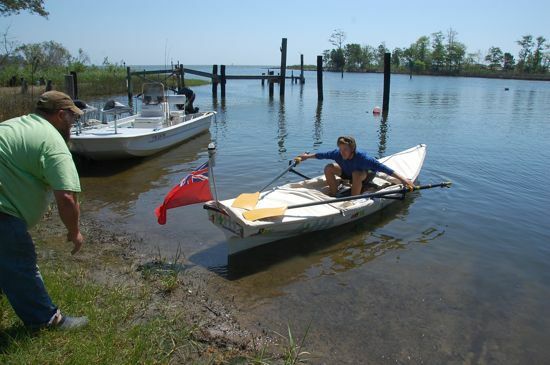 The creek there was calm as glass, but rougher waters awaited on the Neuse River that morning..
Lewis Colam got in to his 15-foot boat at Endurance Seafood, near Pecan Grove Marina, and began rowing. He was a man on a mission — Miami to New York — and anxious to be on his way north. 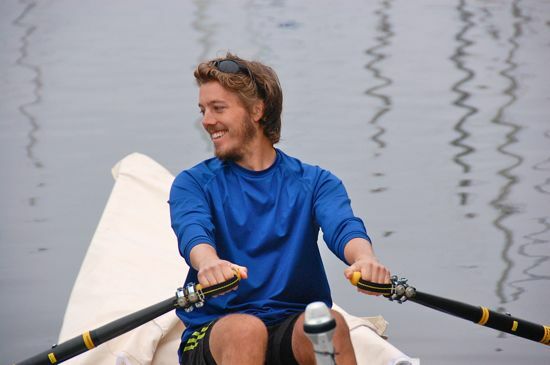 He rowed and rowed, aiming to put in a 10 or 20 mile day. 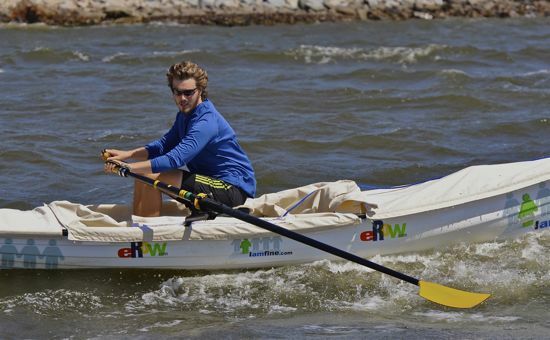 Lewis Colam rows north during a small craft advisory on April 26. The conditions didn’t allow that. 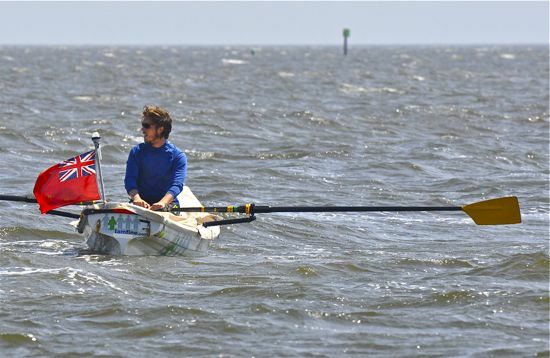 A mile in to that day’s journey, a wave swamped his heavily-laden light-weight rowing scull near the entrance to Whittaker Creek. It would be another three days before Lewis Colam would leave Oriental. How he came to be in Oriental in the first place is a story that began last fall. Lewis says he was working as a management consultant for a retail grocer in London. 24 years old, he says he was looking for an adventure, doing something he hadn’t done before. The Plymouth native also wanted to raise money for a charity, and to to do this without encountering cold weather. It had to be in a place warmer than an English winter. Lewis Colam at Keith Bruno’s Endurance Seafood. 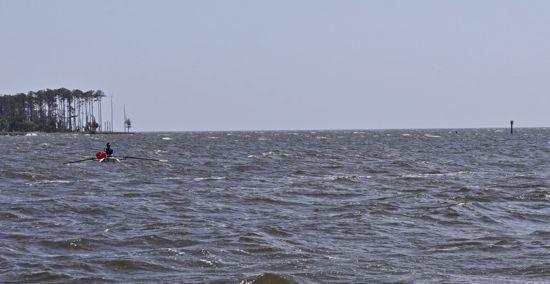 He made repairs to the boat there, namely fixing a hole created days earlier when the rowing boat ran in to a metal rod on the ICW near the SC border. Lewis gave notice within a day or two at his job. 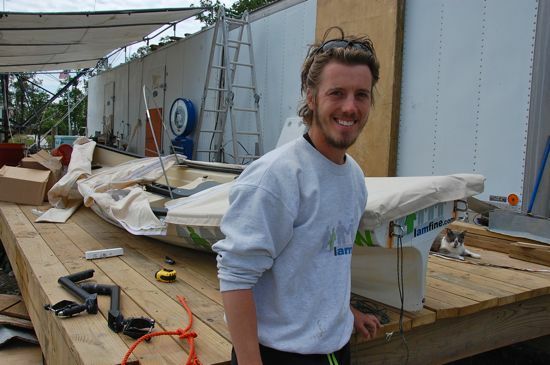 He packed up his London flat, and two months later, he was in Florida where Little River Boatworks was giving him a boat to row. He took off on March 3 without a compass or even charts, just pointing the boat in a direction he thought was north. He says he had to ask sometimes. He eventually got a chart book, tearing out a page at a time for his day’s travel and then throwing it away once he completed that length. 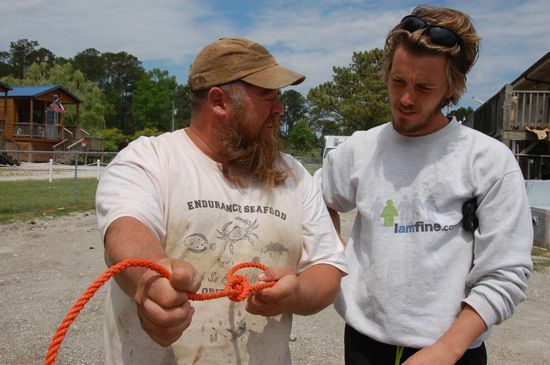 He had been at it for almost two months and was more than halfway in to his 1400 mile row when he pulled up to Keith and Marianne Bruno’s yard at Endurance Seafood on April 24. He had some repairs and retrofits to make and was anxious to resume his trip after a day on land. Rowing off of the Oriental waterfront. Small boat, wide river. Lewis Colam approaching Whittaker Point. His rowing boat would swamp near there, and another repair became necessary, putting off his departure for three days. That said, it wasn’t a solitary Walden experience he was after. But there have been stretches of the trip where he’s gone 3 to 4 days without seeing anyone at all. 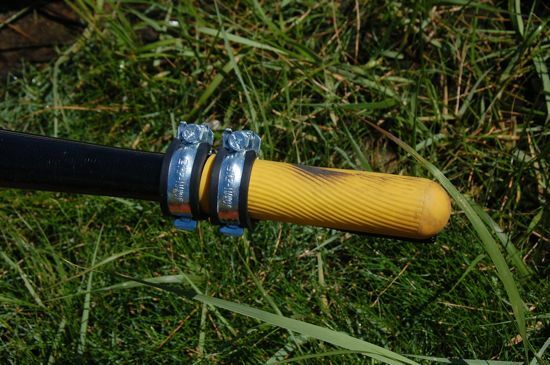 The handle of an oar on the boat, after hundreds of miles up the East Coast. The boat is a light 100 pounds, but with his stores of food and clothing and gear, the weight doubles. When he has to, he’s used the boat as his bunk for the night, removing the rowing seat and stretching out in the middle of the boat. For protection from the elements he says, he put a “canvas sheet” over the open area. Another challenge during those long days of rowing, he says, is “to make sure you don’t go insane.” How does he combat that? Lewis says he’s been listening to audio books. Not so with the audio book version.